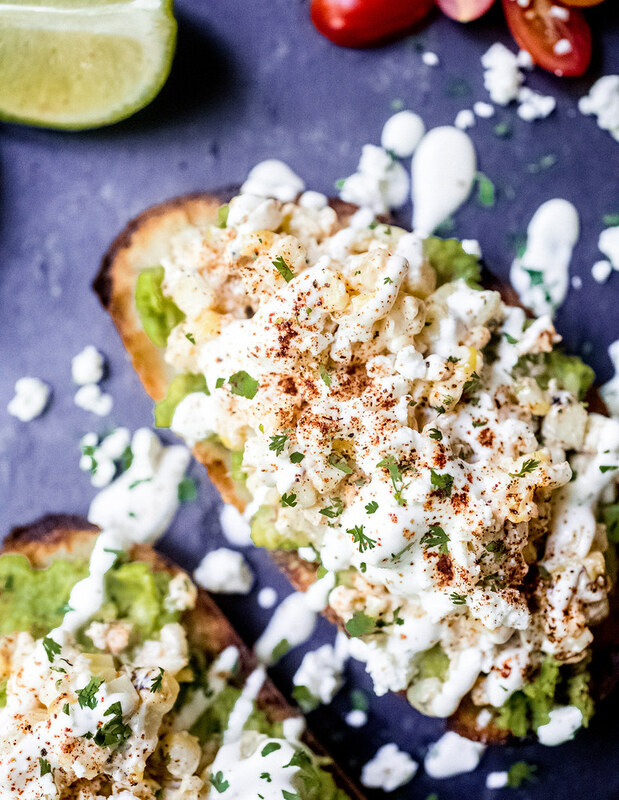 Street corn avocado toast – Bypass the eggs on your avo toast and go straight for the street corn because grilled corn, spices, and cojita are perfect with smashed avocado and crusty bread! Are we saying goodbye to summer with this recipe? Hell no! People, corn is still plentiful at the farm stands, farmer’s markets, grocery stores, and CSAs deep into September! 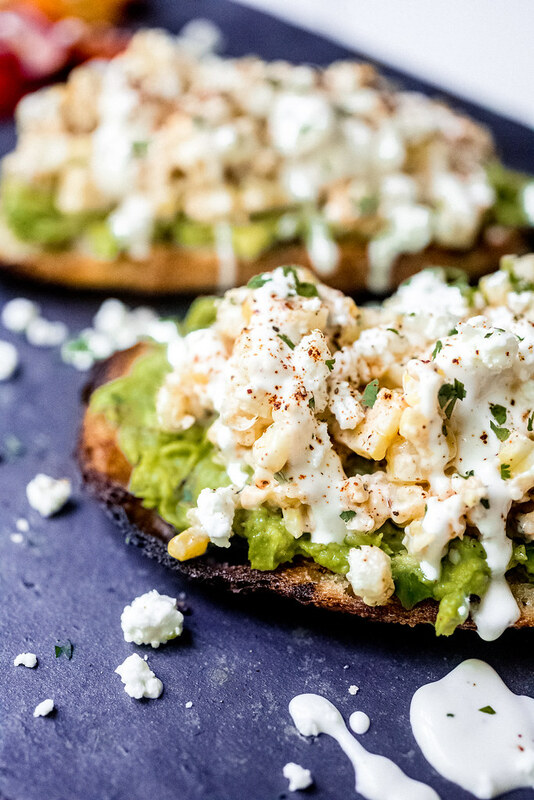 So let’s make some street corn avocado toast, shall we? Because give me allll the street corn!! My cousin and I made a meal out of the Mexican street corn we made back in May and with the leftovers, came this street corn avocado toast. Holy freaking moly! As if the actual street corn on the cob wasn’t amazing enough on its own, we went and disassembled it, smashed some avo on top of grilled bread, and then layered the street corn over the avo. The result? Well, can you imagine the most delicious, spiced-up, creamy corn mixture along with your most favorite avo toast? 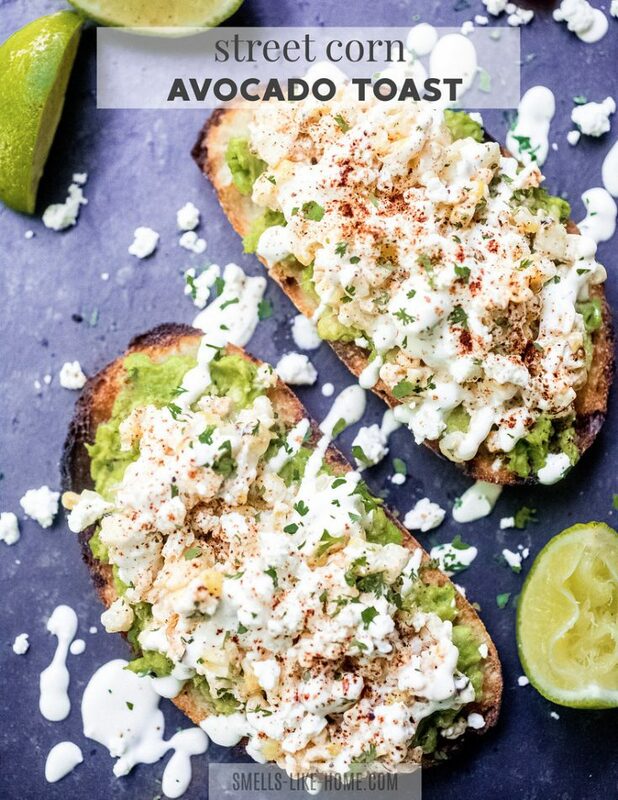 I mean, I’ve been loving on avo toast since before it became the biggest thing since, well, sliced bread (heh.) but when you stack a layer of street corn on top, you’re basically turning me into a puddle. And let’s be real here: meals that take more than 30 to 40 minutes during the week just around my jam anymore. Not with a toddler looping around my legs while I’m cutting veggies and all but shouting for dinner. 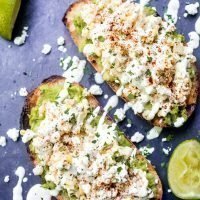 So this toast is just the perfect thing for a weeknight meal or even a really great weekend lunch. The street corn mixture is composed of grilled corn, that insanely delicious lime crema I blathered on about months ago, a bunch of pantry spices, cilantro, and crumbled queso fresco. When we made these toasts the first time, we actually just sliced the Mexican street corn right off the cob and into a bowl. The corn was pre-assembled, if you will, and we were dying to use up the leftovers on some avo toast. But in the months since that first time, I’ve taken to just slicing grilled corn into a bowl and mixing it together with all of the good stuff. Same effect, much simpler method. To make this a fairly quick weeknight meal, I make the crema and mix the spices together on the weekend so they’re both ready to go when I get home from work. The cilantro gets chopped and the cheese is crumbled while the corn is grilling. Then I grilled or broil the toasts and smash up the avocado while the corn is cooling a bit. Guys, this street corn avocado toast is SUCH an easy meal!! If you want to add a salad on the side, that would nice but it’s certainly not needed. No matter how you slice it (sorry for all the bread puns today! 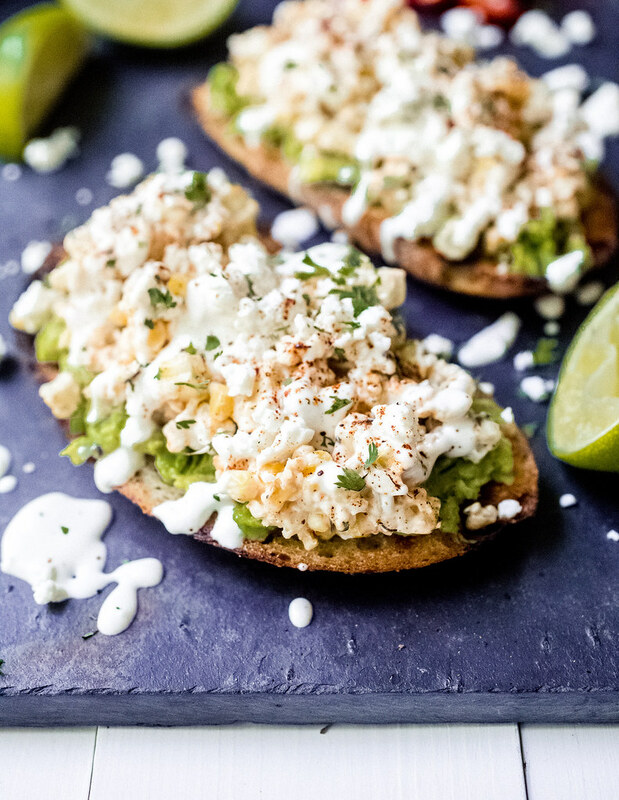 ), you just cannot go wrong with avo toast toppled with Mexican street corn! 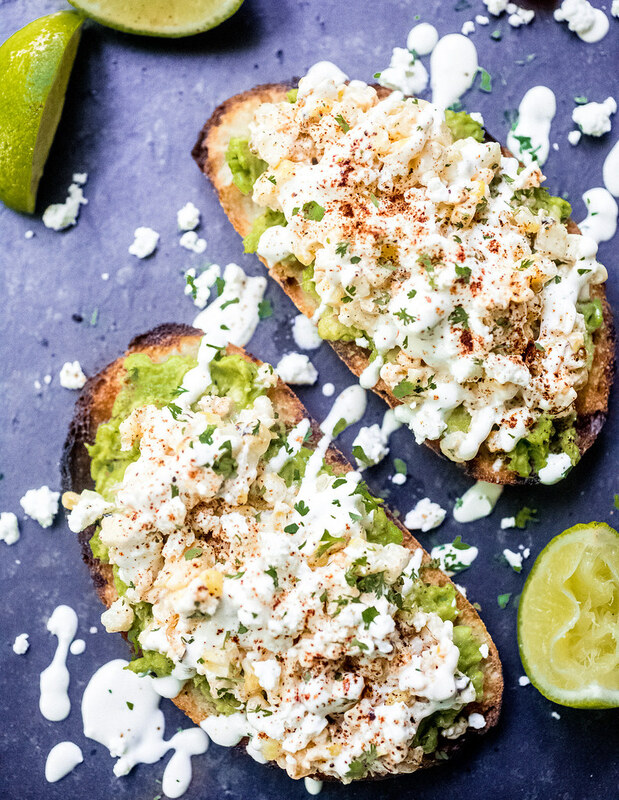 Street corn avocado toast will make you want to bypass the eggs on your avo toast and go straight for the street corn because grilled corn, spices, and cojita are perfect with smashed avocado and crusty bread! Heat grill on high for 10 minutes. Grill the corn for 8 to 10 minutes, turning every couple of minutes so all sides are cooked fairly evenly. Transfer corn to a platter and allow to cool for 10 minutes. While the corn grills, stir the mayonnaise and sour cream together in a small bowl. When the corn has cooled a bit, slice it off the cobs directly into a large bowl. Add the mayonnaise-sour cream mixture, spices, salt and pepper, a few squeezes of lime juice, and half of the crumbled cheese. The best of both worlds colliding: smashed avocado toast and Mexican street corn. Spice things up with some red pepper flakes or fresh jalapeño mixed into the avocado or the street corn - or both!